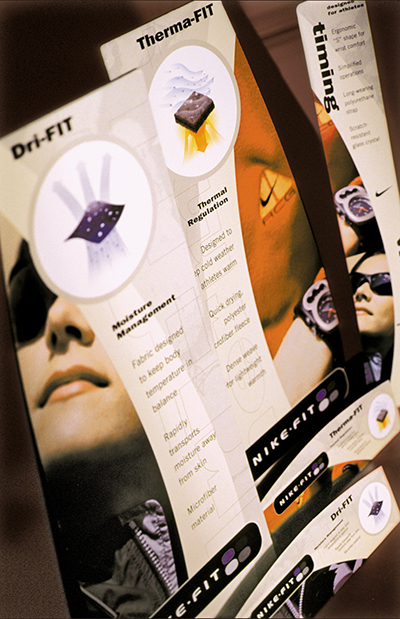 Nike wanted to create retail awareness for their stand alone brand of outdoor footwear and apparel. Nike ACG (All Conditions Gear) features innovative technology such as Dri-FIT and Therma-FIT which keep athletes dry and warm. ACG products like watches, jackets, sunglasses and, of course, shoes were all sold within the same retail environment. 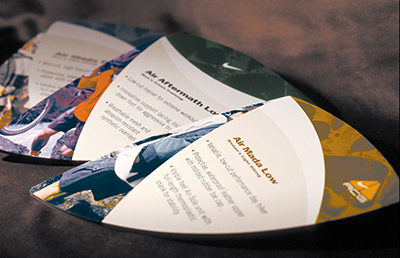 Uniquely shaped, oversized product cards were created to establish an immediate in-store presence. The use of technical illustrations, earthy colors and action photography, taken at Oregon's Mount Hood, provided an active, natural look for every ACG product.